Every year tennis is becoming more popular. In this sport you can do at any age, it will help you to constantly maintain a high vitality, and in addition, it strengthens all the major muscles of your body. An important role in this sport is a tennis racket, to some extent, depend on all of your future success. Using the following tips, you will be able to buy a tennis racketthat will allow you to achieve great results. When you purchase a racket the first thing you need to pay attention is the size of the handle. It is recommended to choose as much as possible the handle - this will allow you to feel much more comfortable and confident in the game. To check how well you fit the chosen handle, you can use the following technique: first, any of the arms, take the racket (the hand should grasp the handle, then the index finger of the other hand drop into the space between the fingers and palm of the hand that holds the racket. If the width of this gap is equal to your index finger, it means that the racket suit you completely. - racket Mid Size and Mid Plus provide better control of the shot. In addition, the size Mid Plus has a more powerful impact. The rim thickness typically ranges from 18 to 30 millimeters. It is thicker, the stronger the flow and tougher she a tennis racket. When choosing a rim, remember that in case you prefer to perform quick shots, you need a thin rim. The thicker will be the rim, the more the chance of failing to hit the ball on it. To get rid of such problems is possible only through regular training. Length of racket is 27 to 29 inches (this is set by the rules). The longer you pick up the racket, the more powerful will get a shot. The last thing to check is balance. Take the racket in the middle, so you check her balance. If the racquet tends to the side of the head, it is designed to play on the back line. If on the contrary, for filing. Professionals prefer to use tennis rackets balanced in the center. The head size of the racket: tennis Rackets, head more than 110 inch2 suitable for playing on the back line or play in pairs. This racket is easier to spin and cut, and also to do powerful strikes. If the clearance is equal to the width of a finger, then this racket is for you. How to choose the right racket. Tennis is very popular these days. Russian athletes have achieved great success in the world. 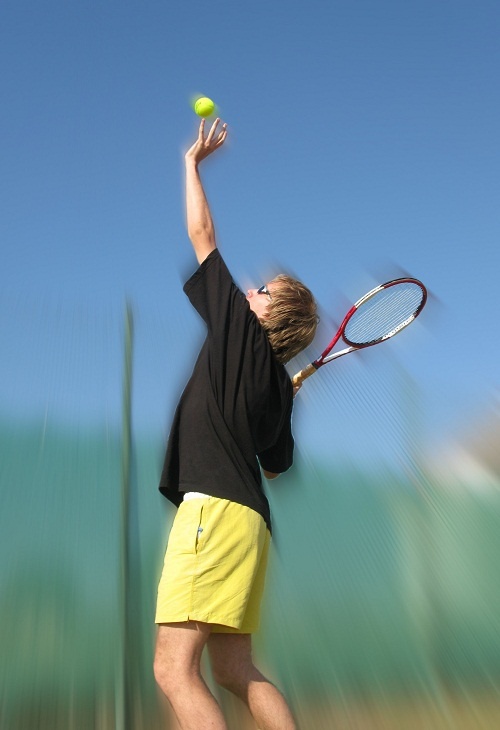 More and more adults and children begin to engage in tennis. Tennis racket for children, mainly made of aluminum and are inexpensive (from 800 to 2,500 rubles), and do not need for beginners, younger players choose an expensive racket for the big tennis, because children are not yet able to assess some of its special qualities.